Vil·la Urània is a small residence of the late nineteenth century that was home to the renowned astronomer Josep Comas i Solà, in the district of Sarrià-Sant Gervasi in Barcelona. The densification of the neighborhood left the building and the small surrounding garden encased between two large dividing walls. The new complex of facilities assumes the challenge of giving a new life to the existing building and gardens by incorporating them into a new building with low environmental impact and reduced energy consumption. Villa’s pre-existence sets the ground level and the first floor of the whole complex. A dual access communicates the plot streets. An adapted ramp path and an external staircase resolves the vertical communications. The lightness of outdoor staircase increases the ventilation and resolves a soft connection with the neighbors that look over the building. The villa becomes the hub of the complex. 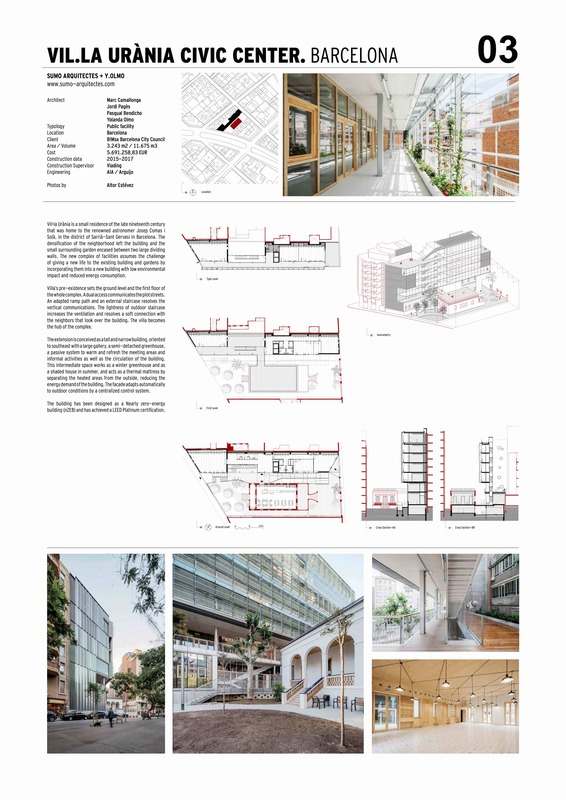 The extension is conceived as a tall and narrow building, oriented to southeast with a large gallery, a semi-detached greenhouse, a passive system to warm and refresh the meeting areas and informal activities as well as the circulation of the building. This intermediate space works as a winter greenhouse and as a shaded house in summer, and acts as a thermal mattress by separating the heated areas from the outside, reducing the energy demand of the building. The facade adapts automatically to outdoor conditions by a centralized control system. The building has been designed as a Nearly zero-energy building (nZEB) and has achieved a LEED Platinum certification.